Since the dawn of the space age, one of the biggest promises of the future was a driverless car. The future’s been a mixed bag—there aren’t any colonies in space, but the Internet is better than anyone could’ve imagined. However, the driverless car is a futuristic dream that’s closer than ever to reality. The camera system and radar sensors of the Mercedes Benz Future Truck 2025 work “like the autopilot on a plane,” according to the Daimler company. This system is entirely onboard, meaning that the truck is truly autonomous. It doesn’t have to rely on control from a different source, or a complicated infrastructure. The truck’s onboard computer system brings 100% focus to long-hauls that could otherwise lead to driver distraction or boredom. The truck also has a next-generation headlight system. Rather than two or four headlights, the Future Truck 2025 has a wide panel of LED lights. This means that the truck will be safer for other drivers on the road without sacrificing visibility. Not only is it safer, though, but the distinctive clean design makes it look like the helmet on a Star Wars villain. As the world’s biggest retailer, no company has more skin in the shipping game than Walmart. With hundreds of billions of dollars in annual revenues, it makes sense that Walmart would be at the forefront of developing some amazing future trucks. In keeping with Walmart’s renewable energy vows, the Walmart Advance Vehicle Experience Concept Truck is electric. It may not be autonomous, but the cab offers driver visibility like no other truck on the road. The driver won’t just be comfortable while driving—the truck offers a full-size sleeper. The vehicle is made exclusively from carbon fiber, making it 4,000 lbs. lighter than comparably sized trucks, which frees up and extra 2 tons for freight. Additionally, its engine and aerodynamics give it great fuel economy for a truck of its size. The name says it all: this is the truck for optimal aerodynamics. Mercedes invested 2,600 hours of wind tunnel testing into the Aerodynamics Truck and Trailer to reduce drag. As a result of all that work, every part of the truck is optimized against wind resistance. Mercedes’s innovations are so cutting edge that the shape of the trailer exceeds regulations, and legislation is going to have to change in order to keep up. According to GizMag, though, “The reported benefits are so significant, however, that this may be achieved in due course.” Where other trucks force their way through the air, Mercedes’s Aerodynamics Truck and Trailer will slice through it. In addition to its striking design, the MAN Spacetruck is built to be aerodynamic, as well, so those who want to stare at it will have to look fast. Every industry has its visionary, genius designers. 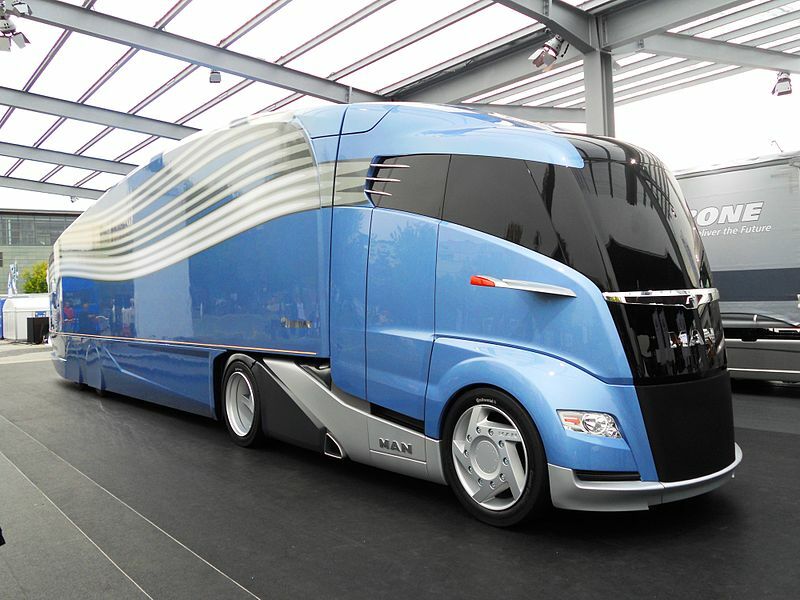 In the world of future trucks, that man is Luigi Colani, a Swiss-German engineer who’s become famous in automotive design circles. 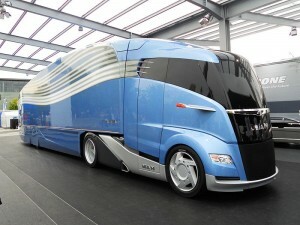 The Innotruck, developed by the Technical University Munich, might be Colani’s most striking design. The Innotruck’s cab looks less like a traditional truck and more like the dearly departed Concorde supersonic jet. It moves like no other truck, too, with the front tires turning on a pivot connected with the cab. The Innotruck is designed to be “both a testbed and a demonstration vehicle for a number of emerging technologies,” meaning that anything that ends up on future trucks may be tested on the Innotruck first. Luigi Colani didn’t become a visionary engineer by only designing one truck—he’s got a whole fleet of next-generation trucks in the works. Built by Mercedes, what he calls his “Biodynamic trucks” are the ultimate in green design. The trucks are memorable for their pod-like cabs, with three windshield wipers that keep the windscreen dry and recall Mercedes Benz’s distinctive logo. However, what’s truly remarkable will be the fuel efficiency. According to Bloomberg Businessweek, Colani is working with the Siemens Corporation to improve fuel efficiency for trucks by 25% or more. Whatever the future holds for trucking, it’s a sure thing that there will be Colani designs on the road. These are just a few of the future trucks that drivers can expect to see on the road the next 10 years. There are even more trucks, currently in the concept stage, that will integrate the most advanced technology of the 21st century to make trucker’s lives easier. When those vehicles come out, Bryant Surety Bonds will be pleased to work with the truckers of the future to help them get bonded and get on the road. Let us know in the comments what next-generation developments in trucking you’re looking forward to. About the Author- Lorenzo Estébanez writes about surety bonds, with a focus on the freight and trucking industry. He is a regular contributor for the Bryant Surety Bonds blog. © 2014, Allen Smith. All rights reserved. Is Truck Driver Pay the Answer to all Issues? I’m in a ’14 Volvo and it’s so automated that the next step will be to lose the driver and get a monkey to open the trailer doors. Do you think these self driving trucks will replace truck drivers? I’m so tired of seeing technology and software take the jobs of hard working middle class Americans. I hope this is not the case with truck drivers. This article (http://www.wsj.com/articles/SB10001424127887324144304578624221804774116) seems to indicate that truck drivers will be replaced by self driving trucks. The only people who will benefit are the CEOs and top level executives who will pocket the extra money saved by not hiring truck drivers. The rich will get richer and this needs to stop. Thanks to all this technology and software, the middle class will disappear and the economic gap will continue to grow.